During the summer months, the Baltimore Blast holds soccer camps for youth soccer players ages 5-13 throughout the Baltimore Metropolitan area. With an emphasis on individual skills and game situations, the Blast players encourage the development of personal achievement and contribution to team effort. Players of every skill level will benefit from instruction by members of the 2003, 2004, 2006, 2008, 2009, 2013, 2016, 2017, and 2018 Champions Baltimore Blast. The Baltimore Blast Summer Soccer Camps are for youth players who desire to reach their full potential in all areas of their lives. Blast campers strive toward the improvement of soccer skills that form a solid foundation upon which they can continue to build on. In addition to the emphasis on soccer skills, Blast campers learn the game, enhance their soccer skills, interact with pro players and learn the values of teamwork, diversity, responsibility and sportsmanship. "Both of my boys voted this camp their favorite summer camp. They even woke up early anticipating all the fun they were going to have at camp." "Great camp. Awesome experience for my 6 yr old. I will do this camp again with all 3 of my boys next year." "Perfect week for my daughter at the Baltimore Blast soccer camp." "The idea of this camp was awesome! The Blast players were so nice and my son really enjoyed it. Learned a bunch of new skills! GREAT CAMP!!!" Teams that want team-oriented training can register for a Baltimore Blast Team Camp. Team Camps are designed specifically for the needs and goals of each individual team. Team Camps offer 10 hours of training, with dates, time and location determined by the team. Training will focus on team responsibilities, systems of play and offensive and defensive tactics. Additional focus on technical and tactical situations that players experience during games. To arrange a Team Camp, please call Mike Conway at the Blast office at 410-558-4292. 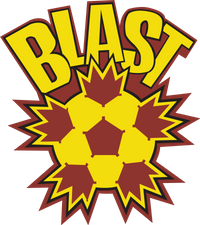 For more information on the upcoming Baltimore Blast Summer Soccer Camp season, please call 410-73-BLAST or email mconway@baltimoreblast.com. P.M. camps run from 5-8 p.m. Depending on the severity of the rain, the camp will go on as scheduled. If you have questions, you can call the Blast weather hotline at 410-73-BLAST (410-732-5278). If the weather is bad enough to cancel camp in advance, it will be noted on the hotline. If the weather is not severe enough to cancel camp in advance, the Blast camp director will have to go to each site to determine the conditions of the field. Therefore, you will have to go to camp in order to find out if the camp is delayed or cancelled. If camp is cancelled due to inclement weather, the Blast will attempt to make up the session but can not guarantee that a make-up date will be scheduled. Cancellations made 21 or more days in advance: subject to a $25 administration fee. Cancellations made 7-21 days in advance: subject to a forfeiture of $50. Cancellations made six days in advance or while camp is in session: refunds will not be issued. The $10 online camp fee is nonrefundable. All cancellations must be made in writing and mailed or faxed to the Baltimore Blast office.